Researchers have developed a new nerve-illuminating tool, which will help surgeons to avoid accidentally injuring nerves and identify nerves requiring repair. 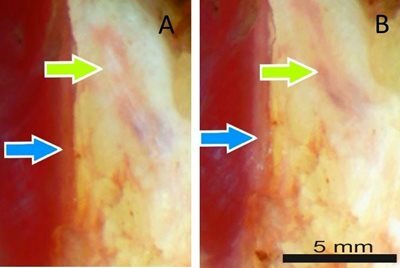 The new tool, which has been developed by Kenneth Chin and Patrick Chin, uses an optical technique called collimated polarized light imaging (CPLi) to identify nerves during surgery. The new noninvasive approach is said to use polarized light to make nerves surpass from other tissue, which will allow surgeons to avoid accidentally injuring nerves. Kenneth Chin is a medical student at the Academic Medical Center (AMC), University of Amsterdam, Netherlands. He later joined a research group headed by Thomas van Gulik, who was a surgeon at the Academic Medical Center. Researchers said the surgeon using CPLi technology can 100% correctly identify nerves in a human hand compared to an accuracy rate of 77% for the surgeon who identified nerves using only a visual inspection. CPLi uses a polarized beam of light to sort out the tissue. When this light passes through a nerve, the tissue’s unique internal structure contemplates the light in a way, which is dependent on how the nerve fiber is oriented compared to the orientation of the polarization of the light. The reflection appears to switch on and off when the light’s polarization is rotated, making the nerve tissue stand out from other tissue. Researchers used it to examine 13 tissue sites from the hand of a human cadaver, after testing the technique on animal tissue. The surgeon using visual inspection correctly identified nerve tissue in 10 of the 13 cases, while the surgeon using CPLi correctly identified nerve tissue in all cases. Chin said: “We have shown that nerves can be distinguished in human tissue by detecting the interaction of light with the structure of nerves without the need for fluorescent markers or physical interaction.